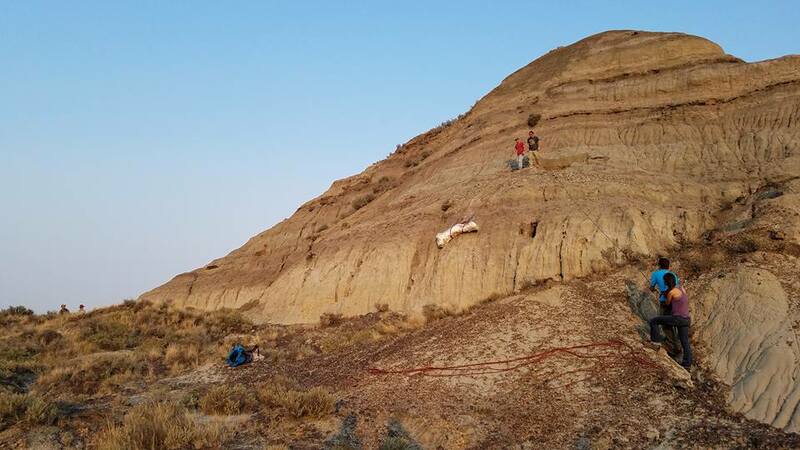 We run an all-encompassing paleontological dig in the scenic badlands of North Dakota and Montana. Our primary goal is the promotion of paleontology, while conducting and supporting research efforts that benefit the scientific community as a whole. To support our goals, we offer participants the chance to take part in our dig. This way, anyone can witness the entire process from discovery to preparation. Each field season we offer the opportunity for you to join our dig. 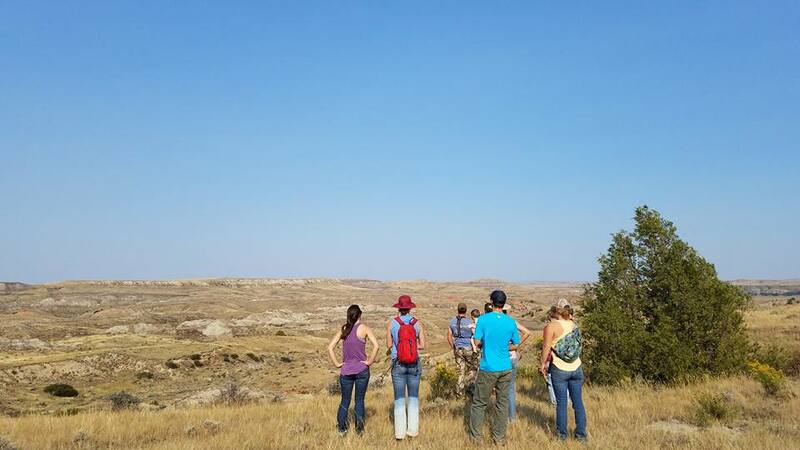 Become part of our team and unearth the full paleontological dig experience, from discovery to preparation in our field lab. You will prospect for fossils and learn to use proper scientific field techniques—having the opportunity to be the first to lay eyes and hands on the fossilized remains of an animal that has not walked this earth in over 66 million years. This is a hands-on experience in which participants learn what it is like to be a paleontologist. You will actually be digging up the fossils as part of our team. You will learn first-hand paleontological field techniques, fossil preparation, mapping, Earth history, and hopefully gain a new excitement toward the sciences. We also incorporate several evening educational seminars each week, often utilizing guest speakers. Meals, lodging, and transportation to field sites is included with each dig charter. Our main camp is located just outside of Marmarth North Dakota. Camp facilities include: field lab, kitchen, showers, restrooms, volunteers' tents, and our field office. If camping concerns you, don’t be alarmed! The camping experience is one of relative comfort. You will get a shower every day, there are modern restrooms at camp, and you have access to electrical outlets. Unless traveling by plane, you generally provide your own camp gear with the exception of a tent and cot. We provide tents for the duration of your charter. They are large high quality tents with 133ft² or more of floor space. Generally there are two participants per tent. If preferred, you may bring and use your own tent. Campers and RVs are also welcome. If you are traveling by plane you will be provided with a sleeping-bag and pillow. Working on the dig usually entails long periods of hiking and sitting. Also, the badlands are generally hot, dry, and sunny during the day. Keep that in mind when considering this dig. In order to break up the day we try to both prospect and work on excavations each day. The field day usually depends on the weather. If it is abnormally hot we may cut the field excavation short for the day. In the rare event of rain we may visit some local museums and have a more lab intensive day. Each day begins with a hot breakfast before setting out to our many field locations. Sack-lunches and water will be provided for the day, though feel free to bring some extra snacks if you like. Evening meals are usually akin to a barbecue. We provide all the food and utensils necessary. Meals are prepared by our staff, but you may be asked to help with some of the clean-up. Vegetarian preferences and food allergies can be accommodated with advance notice. DISCLAIMER: Excavations often require the use of heavy machinery, sharp tools, etc. for proper removal of specimens. A safety overview will be provided at the beginning of the dig. You must acknowledge the natural dangers of working in a remote, arid environment, (local wildlife, dehydration, severe weather, etc.). Further info can be found in the Sign Up section. Thank you for considering our dig, we look forward to hearing from you!